The symbolism of the Goddess is not a parallel structure to the symbolism of God the Father. The Goddess does not rule the world. She is the world. Manifest in each of us, She can be known internally by every individual, in all her magnificent diversity. an image of an ancient goddess and a dragon adorn the body of kathy, the local wisewoman who owns goddess blessed, a most magical of shops in my hood. 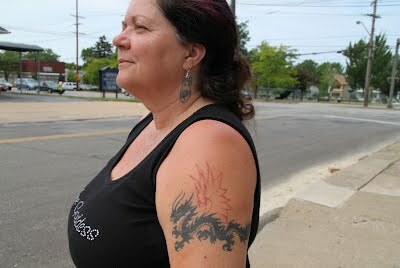 kathy may have a dragon tattoo, however, the other day i encountered a dragon with a girl tattoo. 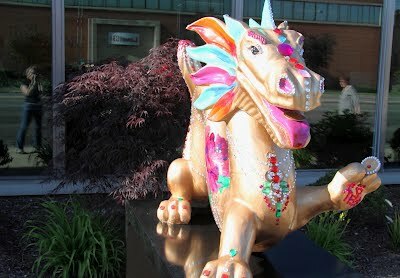 as soon as the dragons were installed i went off on a dragon hunt with a friend - below is a photo of the dragon-hunting party in reflection with the imperial king of all dragons, created by mitzi lai - this is the fourth animal mitzi has had in the annual zodiac project- they are all wonderfully fantastical and all festooned by mitz's signature bling!! to see a slide show of all the dragons which grace cleveland click here - the slide show contains information as to the name of the dragon and the local artist. peter, paul and mary singing their mega hit puff the magic dragon in 1966, the song was written by lenn lipton and peter yarrow in 1963. the concert footage is part of the bbc series tonight in person. I love these types of art projects. They're fun, creative, whimsical. Burlington, VT has or did have cows just a bit smaller than life size, cast out of some synthetic material (I think) each one painted by a different artist & displayed throughout the charming downtown. Those dragons are great! 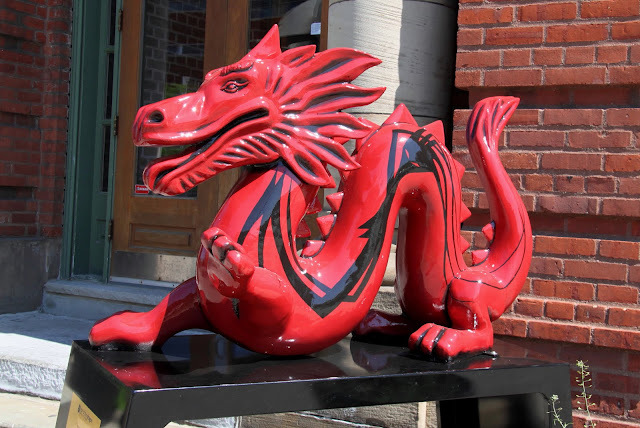 I love the idea of the dragon with the girl tattoo. That's pretty brilliant. And of course I love Peter, Paul and Mary (RIP Mary), but "Puff" always makes me sad!